Blog Decking options abound, but which one is right for you? Decking options abound, but which one is right for you? Today’s home improvement consumers have more choices than ever when it comes to building the deck of their dreams. Western Red Cedar is the traditional favorite of many home owners in the Pacific Northwest. In addition to its beautiful reddish-brown hues, Western Red Cedar is extremely user friendly. It is lightweight, easy to cut, resists splitting when nailed, has uncommon dimensional stability, accepts stain better than any other softwood and it is virtually free of pitch and tar, which can cause unsightly stains. 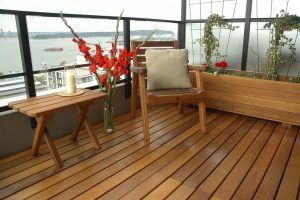 More homeowners are opting for hardwood decks, such as Ipe, Red or Yellow Balau and Dark Red Meranti. Hardwoods are darker in color, typically heavier, and stronger than cedar. 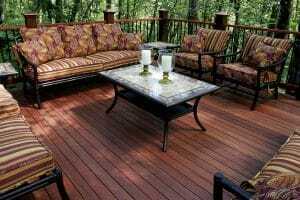 They also have the highest resistance to decay of any wood deck product. Consequently, as compared to cedar, 5/4” and in some cases 1” nominal boards are typically used in constructing a hardwood deck. However, the inherent strength of hardwoods causes some special considerations in their application process. 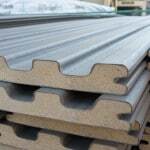 It is recommended that each board be predrilled, screwed and glued to the deck joists. Furthermore, both ends of each hardwood deck boards should be waxed. It is also extremely important for your hardwood deck to be constructed with adequate air ventilation. As a result, it is recommended that a hardwood deck have at least 12” clearance from the ground. Because of these considerations, make sure that your decking contractor is familiar with the differences between hardwood and traditional softwood decks. It is advisable to have any wood deck prestained before application. In the event any mud or dirt gets on the surface of a raw wood deck, it may have to be sanded to remove the resulting stain. Prestaining your deck prior to application avoids this unfortunate situation. All four sides of each board should be coated with a high quality oil based stain. Darker stains will typically last longer than lighter stains. A clear coat may have to be restained as frequently as once a year to prevent the natural “graying effect” of wood. Hardwood decks are denser than cedar and will require special stains with greater penetration properties. Painting your deck with a solid paint is not recommended. Recent advancements in the production of composite and poly vinyl chloride (aka “PVC”) decks have made them durable and reliable alternatives to traditional wood decks. The primary advantage of composite and PVC decks is that they require minimal maintenance. However, it is still recommended that they be cleaned periodically with a quality deck wash. Composite and PVC decks are much less likely to rot, warp or splinter than wood decks and most come with 20 year warranties. The latest generation of composite decks feature “capped stock” technology, in which the composite core is encapsulated in a tough PVC shell. Some products are capped on three sides, while others are capped on all four sides. It is important to remember that composite and PVC are not “bullet proof” and may still be damaged by dragging heavy furniture, scratches by pets and the occasional errant charcoal briquette. Lastly, in the event a deck manufacturer stops producing a specific color you may have difficulty finding an exact match if a board needs to be replaced. Consequently, storing away a few extra boards upon completion of your deck project “just in case” is probably not a bad idea.